WASHINGTON (Nov. 13, 2015) -- There are at least two things in the Army you can't choose: who you report to, and what your mission will be, the commander of U.S. Army Corps of Engineers said. "All through your life you will have missions you don't like, but you can't pick your mission. And you will have bosses you don't like, but you can't pick your bosses," Lt. Gen. Thomas P. Bostick said. "The good news is that those two things always change." Lt. Gen. Robert S. Ferrell, Army CIO/G-6, speaks during a mentorship forum for ROTC cadets at Howard University in Washington, D.C., Nov. 10, 2015. Bostick and 10 other active-duty Army generals, as well as one now retired general, sat on a panel at Howard University in Washington, D.C, Oct. 10. The panel was also attended by several ROTC cadets from 13 schools in Virginia, Maryland and the nation's capital. The general officers volunteered their time to provide advice, guidance, mentorship and perspective from the top to those young Americans who are expected to, but haven't yet, entered the Army as officers at the very bottom. "You will have the opportunity to see all kinds of missions and bosses," Bostick told the cadets. "My message to you is that the Army needs you, the nation needs you, and they need you to continue to serve. You've already made the initial sacrifice by serving through ROTC." Lt. Gen. James C. McConville, the Army's G-1, told cadets to keep in mind the three things the Army expects of a second lieutenant. "One is you be physically fit," he said. "The second is we expect you to have integrity and character. And the third thing is we expect you to be willing to learn, because we are going to teach you everything you need to know." The Army provides young enlistees and young officers "the opportunity to do maybe the most important things that you can do in your lives," McConville said. "The other thing is you get a chance to serve in the most respected institution in the country. That's quite an honor. And when you get a chance to see the Soldiers that you are going to have a chance to serve with, it's just an incredible privilege." Lt. Gen. Gary H. Cheek, director of the Army staff, told cadets they should set their sights now on being honor graduates from the Army's officer basic course. "Your Soldiers are looking at you from the day they arrive. They want you to be competent and want you to be smart and know your business. You will learn that in officer basic course," Cheek said. "Soldiers also want you to treat them fairly. And the third thing is they expect you to have impeccable moral character and do the right thing. If your set yourself on that path, you will love the Army and have a great time with it and a great future." Cheek also recommended that the cadets make it a goal now to one day command a company of Soldiers. "The greatest honor we can give you is to command and lead 100 young Americans in the U.S. Army. If you focus on that as your goal starting your career, it will benefit you in enormous ways," Cheek said. "Commit yourself today that you want to take advantage of the greatest opportunity the Army can offer you: to command a company." 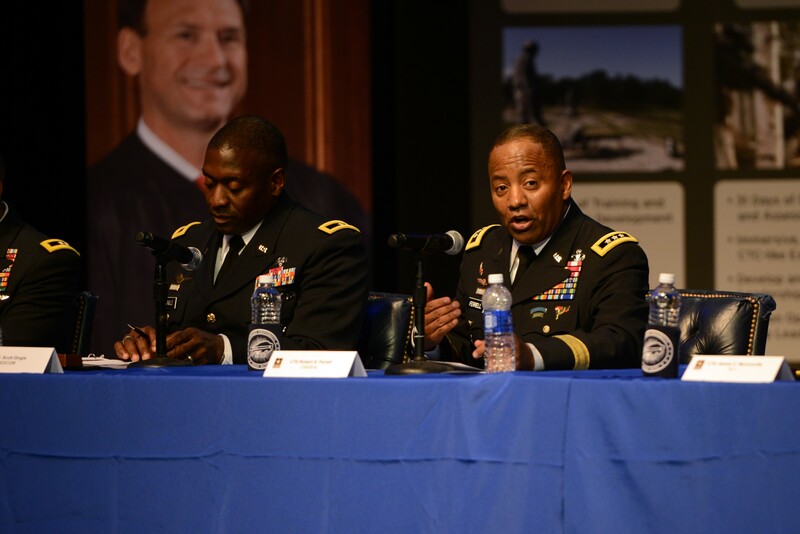 A key proponent of the event at Howard University was Lt. Gen. Robert S. Ferrell, who serves now as the Army's chief information officer and G-6. "It's very important that we take time - we as leaders - to have a dialogue with our future leaders and entertain any questions they might have, but also provide them with an insight of the current Army today and the Army they will come into when they get commissioned," Ferrell said. During the half-day event at Howard University, the cadets were able to mingle with the general officers during an informal lunch, to ask questions of them, and then afterward ask questions of them in a more formal setting. Ferrell said the officers told some of their personal stories about their experience in the Army, letting cadets know how they as officers were able to succeed in the service. "We really focused on our current chief's priorities: readiness, building the future force, and taking care of Soldiers, Department of the Army civilians and Families," Ferrell said. "As a broadening event, this event was a home run." Maj. Gen. Peggy C. Combs, commander of U.S. Army Cadet Command, said the event provided benefit to both officers and cadets. For the generals, she said, it provided a chance to "see the future" of the Army in the young cadets that will one day lead the service. "Some of my staff mates don't get to see that, and this gives them a sense of renewed optimism about the future and what's coming in," she said. For cadets, "it gives them the role models," she said. She also said that while cadets ought to be focusing on being the best lieutenants they can be, hearing senior officer stories about growing up in the Army lets them know that it's really possible for them to one day become a general officer. "It lets them see these are real people who love what they do," Combs said. "It's not like 'those folks in the Pentagon.' Its real people who enjoy their service, and who started out like they did - not knowing what to expect in the future." Combs said that Army ROTC commissions more than 5,600 officers a year into the active-duty force, the Army National Guard and the Army Reserve. About 78 percent of commissions in the Army, she said, come from ROTC. "We develop and commission the majority of the Army officer corps," Combs said, adding that ROTC has a "huge impact" on the diversity of thought within the officer corps. "We have cadets that come from more than 1,000 college campuses. What's exciting about that is all of these folks are trained by different educators. They all bring a different way of thinking about problems. It spurs innovation in our Army when you have folks that can think differently about a problem and they all come together in a unit. I think that diversity of thought and perspective is the strength of Army ROTC." Cadet 1st Sgt. Lee RiveraResto, who is in her third year of ROTC at Norfolk State University, Norfolk, Virginia, is majoring in psychology and said she hopes to go into the Army Medical Corps or into military intelligence. RiveraResto said she was impressed by the openness of the forum at Howard University. "We had that kind of mingling session before the forum," she said. "It was a very comfortable atmosphere, and I thought that was very important. It set the tone for the panel today." While talking face-to-face with general officers during the informal lunch at the university, RiveraResto said she was able to ask questions of several of the female general officers and get back some truly honest feedback. "They were very open and honest with the answers they gave," she said. "They weren't cookie-cutter answers. They were very blunt, and they really wanted me to understand the pros and cons of being a female or wanting a relationship and Family while serving in the Army." Cadet Capt. Johnnie Jackson, now a senior at Old Dominion, also in Norfolk, is earning a degree in finance. He said he also hopes to serve as a military intelligence officer when he commissions. He said he saw the half-day event at Howard University as similar to how one commander passes command to another with a "left seat/right seat ride." Except during the forum, the generals weren't passing command but advice. "I got a lot of take-away from this, like about the basis of leadership: being able to establish loyalty, communication and trust ... and being a confident leader. It was great," he said. Ferrell also thanked Howard University for hosting the event for the second year in a row. "It took a lot of coordination to put this together," he said. "We appreciate it, from the chief of staff of the Army on down. They opened the doors and provided a truly professional event that each of these men and women will remember ... the opportunity they had to have a sit-down dialogue with the senior leaders from the Army." Officers participating in the event included Lt. Gen. Gary H. Cheek, director of the Army staff; Brig. Gen. Patricia A. Frost, U.S. Army Cyber Command; Maj. Gen. Timothy M. McKeithen, National Guard; Brig. Gen. Scott Dingle, Army Medical Command; Lt. Gen. Robert S. Ferrell, CIO/G-6; Lt. Gen. James C. McConville, Army G-1; Maj. Gen. Peggy C. Combs, Cadet Command; Lt. Gen. Thomas P. Bostick, commander of the U.S. Army Corps of Engineers; Maj. Gen. Phillip M. Churn, Army Reserve; Lt. Gen. Flora D. Darpino, Army judge advocate general; Maj. Gen. Paul E. Funk II, Army G-3/5/7; and retired Brig. Gen. Earl Simms, chairman of "The Rocks, Inc."